It is unlikely that casino operators and local Japanese partners will announce tie-ups for casino licence bids in that country until after the passage of an implementation bill for the industry. So said Steven Tight (pictured), president of international development for U.S.-based casino group Caesars Entertainment Corp, in comments to GGRAsia on Wednesday. He was speaking on the sidelines at the first day of the Japan Gaming Congress in Tokyo. 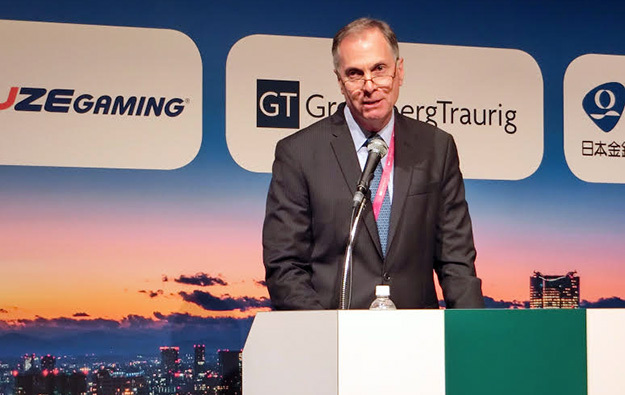 The conference about the nascent Japanese casino sector has been organised by Clarion Events Ltd.
“At this point in time no Japanese consortium has formalised an agreement with any of the operators, so we are all in a ‘dating game’ so-to-speak,” Mr Tight told GGRAsia. The second piece of legislation will detail the specifics for the casino industry in Japan: how casinos are administered and regulated; the taxation regime to be applied to them; their location; and the number of licences to be issued. Global Market Advisors LLC – a U.S.-based consultant to the casino gaming, hotel and airline industries – estimated in a recent white paper that the Japanese parliament, also known as the Diet, could approve the implementation bill by the end of this year. The consultancy estimates Japan’s process for deciding on the location of resorts will be completed by the third quarter of 2018. This would be followed by the request for proposal stage, with the winners chosen by the third quarter of 2019, it said. Following the passage on December 14 of an enabling bill to legalise casinos in Japan, a number of investment analysts have mentioned the possibility that foreign firms with expertise in casino operations might link – in likelihood as minority partners – with Japanese firms looking for new growth opportunities at home, in order to bid jointly for a Japanese casino licence. Banking group Morgan Stanley said in a December 15 note that any casino venue or venues in Japan might only open after the year 2021, noting the second piece of legislation was necessary to establish the administrative framework of the industry. GGRAsia asked Mr Tight how much the Caesars group might be willing to invest with partners. In February Caesars Entertainment reported a full-year 2016 net loss of US$2.7 billion for its “Continuing CEC” unit. Caesars Entertainment Operating Co Inc (CEOC) – constituted as an operating unit of Caesars Entertainment – sought protection from bankruptcy via the U.S. courts in January 2015, weighed by a US$18-billion debt load. It was part of a plan to cut group debt by approximately US$10 billion. In January this year, a U.S. Bankruptcy Court in Illinois approved the operating unit’s reorganisation plan, which Caesars Entertainment said would allow for a “successful conclusion to CEOC’s bankruptcy in 2017”. On Wednesday, Mr Tight told GGRAsia that access to cash for a Japan project “wouldn’t be an issue”. He noted that because Caesars Entertainment currently had 47 properties – in locations ranging from ski resorts to beachfronts as well as major gaming hubs – across six countries, it had the potential to compete for a licence in a large city or in one of Japan’s non-metropolitian regions. Investment analysts have mentioned the likelihood of a phased issuing of several Japanese casino licences, in likelihood starting with metropolitan areas and then extending to several regional locations. “We are interested in a number of sites still, because it’s just too early to rule anything out,” stated the executive to GGRAsia. Earlier in his conference presentation, Mr Tight had said that what he referred to as a “JER” or “Japanese entertainment resort,” should be “uniquely Japanese”. “We don’t want Japan to be a replica of what you find in Las Vegas or Macau or Singapore, or any of the other IRs [integrated resorts] of the past,” Mr Tight suggested. The executive stated that an important factor differentiating Caesars Entertainment from the competition was its leadership in responsible gambling practices – a topic area often mentioned by Japanese lawmakers. “We are recognised for our developments in responsible gaming and gaming addiction: we were one of the first to identify the issue, develop programmes and now fund programmes to try and address gaming addiction,” said Mr Tight.